Supporters of Denver's homeless are planning to gather outside the Rescue Mission as the city starts to clear homeless camps Tuesday morning. City officials recently announced they would break up camps near downtown shelters around Park Avenue West and Broadway. The city put up notices Monday morning, alerting people that they had 24 hours to clear the sidewalks before items are removed. The city said it will first give people a verbal warning. If that isn't followed, it will result in a written citation and then, ultimately, there could be arrests. City officials said despite their Downtown Denver Homeless Outreach program, homeless camps persist. They called the situation "unsafe, unhealthy, unsanitary and inhumane." The city said it will not prevent people from being or sleeping on the streets. Spokesperson Julie Smith said while city officials could start taking items on Tuesday, enforcement measures may be rolled out over several days. Denver Rescue Mission says the move may encourage people to come inside and get connected with services to help get them off the streets. "We've had a few nights where we've hit our capacity, but overall, we're actually at about 90%," said Alexxa Gagner, who works at the Mission. "We're a mens only shelter here at Denver Rescue Mission, but we can refer people over to the womens shelter. It's my understanding that most of the shelters have not hit capacity." 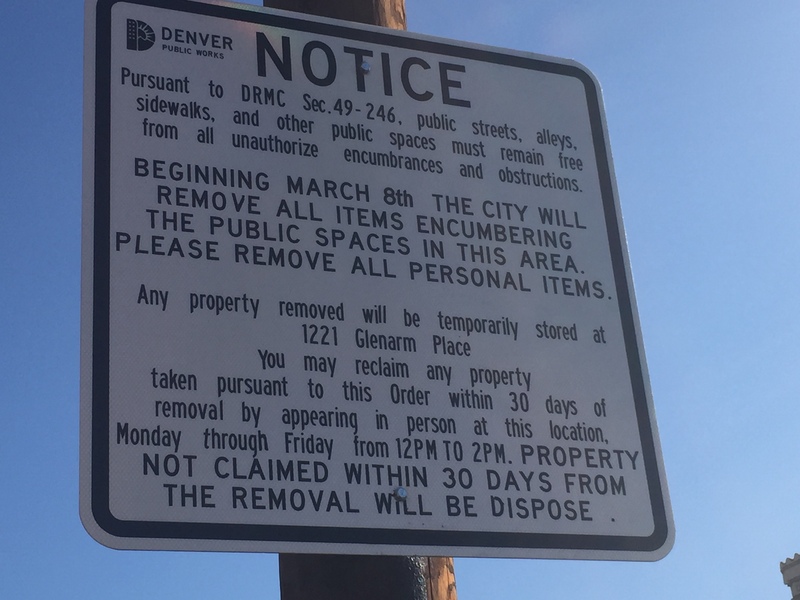 The group, Denver Homeless Outloud, calls the city's plan a human rights violation and demanded that Mayor Michael Hancock put an immediate stop to the scheduled sweep. They estimate about 75 homeless live outside on Park Ave., Lawrence Street, Broadway and the surrounding blocks. "Once they've established their little place to live, it's their nook and cranny and that's their home," said Josh Moore, who was recently homeless. "And when they've got to move, it's probably pretty degrading." Any items left behind or in the public right of way will be taken to 1221 Glenarm Place where they will be available for pickup Monday through Friday from 12 p.m. to 2 p.m. Unclaimed items within 30 days will be destroyed. Anyone with questions related to picking up property is asked to call 311. "It is unfortunate that the City is moving more aggressively to enforce the camping ban and other laws that criminalize homelessness at this time. We agree that the current conditions of people on the streets is not sustainable but criminalization is not the answer."